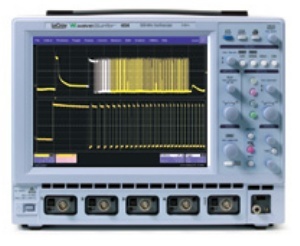 From its large 10.4" LCD touch screen to its space-saving small footprint, the WaveSurfer oscilloscope is a radical rethinking of the basic bench scope. It breaks the rules of conventional scope design to deliver dramatically improved signal viewing, 100x the capture time, and up-to-the-minute connectivity capabilities. But more importantly, it is designed for the way you like to work- big, sharp images of your signal, a simple, easy-to-use interface and a strong tool set for testing and debugging. Bottom line? It is not only a great fit for your bench, it is a perfect match for your budget.